Find the right tour for you through Luang Prabang. We've got 232 tours going to Luang Prabang, starting from just 3 days in length, and the longest tour is 134 days. The most popular month to go is November, which has the most number of tour departures. "The Crown Plaza hotel in Vientiane was amazing. The second hotel was not good at..."
"My GIVE trip was better and greater than anything I ever imagined. I didn't have..."
"I still don't understand why Day 1 starts with a city tour. Surely Day 1 should start..."
"There was just some confusion over whether I had reserved a single room, how many..."
"The best parts of this Intrepid tour: the abundance of little food stalls & markets,..."
"Great itinerary with the mix of everything." 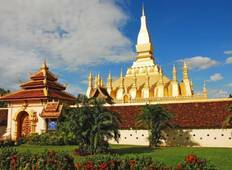 "Absolutely loved Laos although would have liked to have spent more time in Luang..."